High starting salaries, combined with the growing need for nurses in Texas, has pushed local entities to provide training so more of the workforce can enter the medical field. With National Nurses Week lasting from May 6 through May 12, the personal-finance website WalletHub released a report on which states are best for working nurses. According to WalletHub’s study, Texas ranks first in the best monthly average starting salary for nurses, when adjusted for cost of living. The U.S. Bureau of Labor Statistics lists the average Texas nurse earning $72,070 a year. In May 2017, the median annual wage for registered nurses nationally was $70,000. From 2016 to 2026, the number of nursing jobs are expected to grow by 15 percent nationwide, much faster than the national average of all occupations, according to BLS data. Seton Medical Center Hays Chief Nursing Officer Nikki Rivers said demand for nurses in Kyle and Buda has increased and will continue to do so in the foreseeable future. The demand, as well as Hays County’s quality of life, has led to new nurses coming to the area, Rivers said. Seton Hays, paired with the relative affordability of the area and schools within Hays CISD, have more and more nurses looking south of Austin for work. “I think (Kyle and Buda) are becoming more appealing, especially to younger nurses looking to raise a family,” she said. The hospital’s relationship with educational institutions helps keep Seton Hays on the mind of recent graduates looking for work in a hospital. Hays CISD has a curriculum that trains students to meet the rising demands for nurses and related jobs, said Career and Technical Education Director Suzi Mitchell. 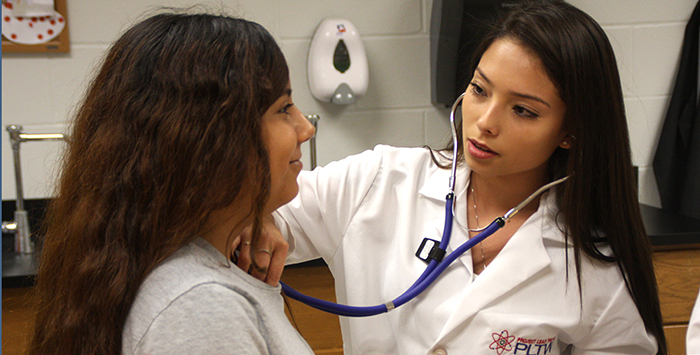 Last week, eight students at Hays High received their medical assistant certification, which, she said, they can use as a stepping stone to becoming a registered nurse. The district also has programs that enable students to get their EMT certification and take medical billing and coding courses. The jobs that require those skills are in demand and pay well, Mitchell said. With these certificates, students can work straight out of school to get their foot in the door and take more classes to become a registered nurse later. Combined, there are about 100 students enrolled in biomedical, EMT and medical billing and coding courses at Lehman and Hays high schools this school year, Mitchell said. “These jobs are in demand and these students can go to work right away,” Mitchell said. With new service lines coming and expansions of beds for hospital patients and the mother-baby unit, Rivers said Seton Hays will need to “heavily recruit” new staff in the next sixth months to a year. “With the continued growth in Hays County, whether it’s the new addition of clinics or expansion of our hospital, no doubt the need for nursing will continue to increase,” Rivers said.